Select style from the drop down box and add to shopping basket. Lamp holders in a variety of sizes, fittings and finishes, choose from antique brass, brass, chrome, porcelain and Bakelite plastic. Base entry lampholders internal thread is 26 TPI. 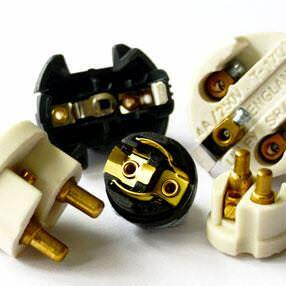 All lamp holders are ideal for use with our lighting flex cord. For more details regarding our bulbholders please see Lampholder Information page. Edison Screw (ES) earthed Cord Grip bulb holder available in brass, chrome and aged brass finish. 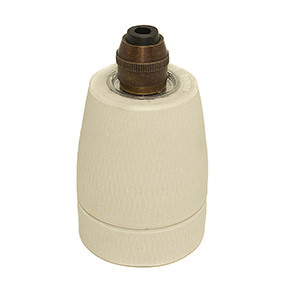 Supplied with 2 shade rings to retain a lampshade with a 1½" opening. Made in the UK to BS EN 60238. Plain ES earthed Lampholder with Cord Grip. This un-threaded edison bulb holder is available in antique brass, polished brass and chrome finish. Made in the UK to BS EN 60238. Edison Screw Bulbholder with ½" or 10mm entry at the base and comes with two matching metal shade rings. Available in aged brass, solid brass and chrome finish. The shade rings will retain a lampshade with a 1½" opening. Made in the UK to BS EN 60238. 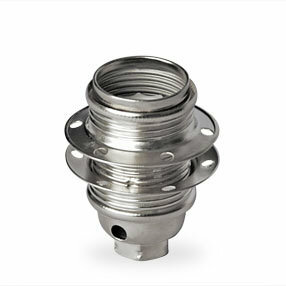 Plain Edison Screw Lampholder with half inch or 10mm threaded base. Available in vintage brass, polished brass and chrome finish. Made in the UK to BS EN 60238. Edison Screw Batten Lampholder with shade rings available in antique, brass and chrome finishes. Suitable for a shade with a 1½" aperture. Takes an E27 bulb. Supplied with 2 screws. Made in the UK to BS EN 60238. Edison Screw Bulb Lampholder with Hook in aged brass, brass and chrome finishes. This threaded bulb holder has matching shade rings included to retain a lampshade with a 1½" opening. The sturdy hook can be used with chain to hold up to 5kg. Made in the UK to BS EN 60238. 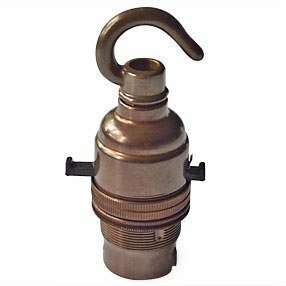 E27 Bulb Lampholder with Hook in aged brass, Brass and Chrome finishes. This plain lightbulb holder has a solid brass hook in the chosen matching finish. The sturdy hook can be used with chain to hold up to 5kg. Made in the UK to BS EN 60238. Side entry lampholders with shade rings. 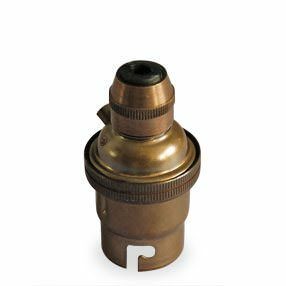 This Edison Screw lampholder has a half inch male thread at the base, the reducer at the base can be removed to make a 10mm entry. A black plastic grommet allows for the flex to come out of the side without it getting frayed. The black grub screw grips the flex inside the tube to stop it pulling. Made in the UK to BS EN 60238. Solid brass Edison Screw lampholder with a 4" riser available in our three finishes of vintage brass, polished brass and chrome effect. 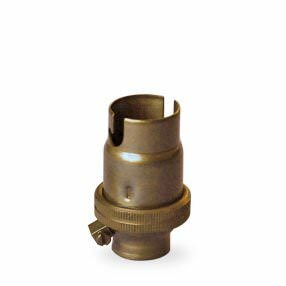 The solid brass 10cm tube comes in your matching chosen finish and matching base plate comes complete with screw holes and 2 matching screws. Suitable for a shade with 1½" aperture. Manufactured in the UK to EN 60238. 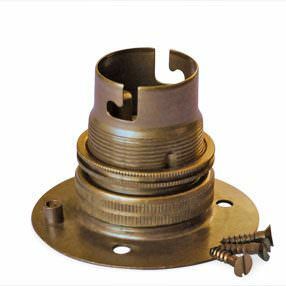 Edison Screw Lampholder with a 180 degree swivel angled arm which can be rotated and fixed into any position required using the side wing nut. This also has a base plate for fixing to a solid surface. Available in vintage finish, brass and chrome plate finish (not wired). Supplied with 2 matching screws. Giant Edison Screw lampholders available in antique brass & chrome finishes with no shade rings and a cord grip for a ceiling pendant - just add a giant bulb for a statement piece. 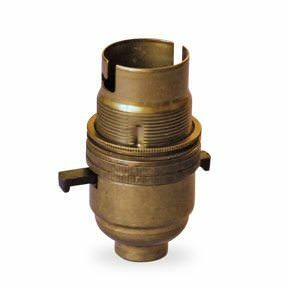 The base entry originally has a 3/8" BSP entry but we have added a reducer to take it down to 10mm to compliment the rest of our stock. Made in the UK to BS EN 60238. Lovely Industrial look. 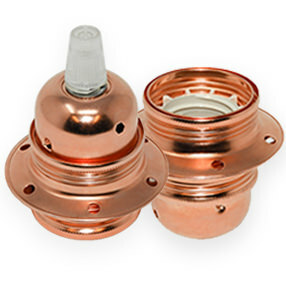 Threaded Copper plated E27 bulb holder with two shade-retaining rings available with or without a clear cord grip. Base entry for the cord grip is 10mm female thread. This lampholder has an earth terminal and should be wired up using a 3 core earthed flex. 2 amp / 250 volts rating. Dimensions: w=38mm h=54mm or 74mm (with cord grip). Small Edison Screw Brass and Chrome plated steel (SES) earthed Candle Lampholders with a 10mm entry. These come with 2 matching shade rings. Not available in Aged finish. Made in Italy to EN 60238. 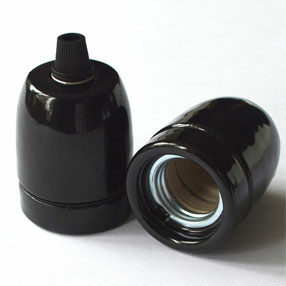 Black ES Bulbholders with shade rings, with or without a black cord grip. 10mm female thread at the base. These lampholders be used with our 2 core and 3 core flex. 2 amp and 250 volts rated. Comes in 2 parts as a safety feature. Made in Italy to standard EN 60238. Dimensions: w=40mm, h=54mm or 70mm (with cord grip). Bakelite ES Bulbholders without shade rings, with or without a black cord grip. 10mm female thread at the base. These lampholders be used with our 2 core and 3 core flex. 2 amp and 250 volts rated. Comes in 2 parts as a safety feature. Made in Italy to standard EN 60238. 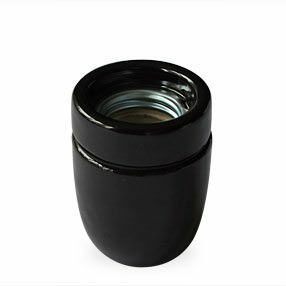 Lovely Glazed black porcelain E27 Lamp holder with or without a black cord grip. 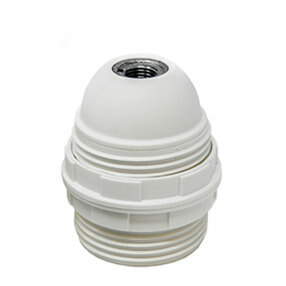 This bulbholder has no earth it has two internal screw wire terminals for Live and Neutral wires. Base entry for the cord grip is 10mm female thread. (M10 X1). 250V 4A, T230 working temperature. Dimensions: w=47mm, h=58mm or 80mm (with cord grip). 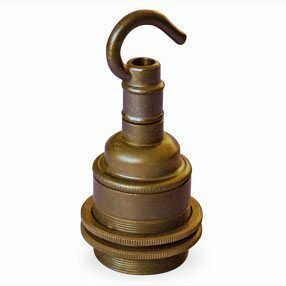 Bakelite Candle SES Lampholder available as Unthreaded (without shade rings) and Threaded (with 2 shade rings). This candle bulb holder has 10mm female thread at base. 2 amp / 250 volts. Made in Italy to standard EN 60238. 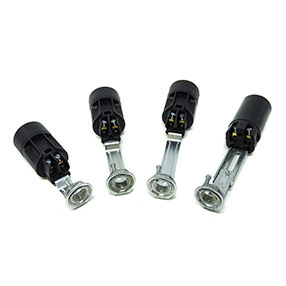 Small Edison Screw (SES) candle tube lampholder in 4 sizes. 3 set lengths of 65mm, 82mm and 100mm, plus our adjustable candle bulb holder which ranges from 80mm to 105m high. The base has a 10mm female thread. Ideal for use with our card candle tubes. Made in Italy to standard EN 60238. Dimensions: h=65mm / h=82mm / h=100mm. 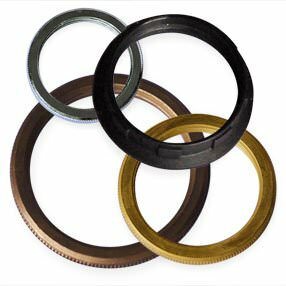 Adjustable: w=23mm, h=80 to 105mm. ES Bulbholders with shade rings, with or without a white cord grip. 10mm female thread at the base. These lampholders can be used with our 2 core and 3 core flex. 2 amp and 250 volts rated. Comes in 2 parts as a safety feature. Made in Italy to standard EN 60238. 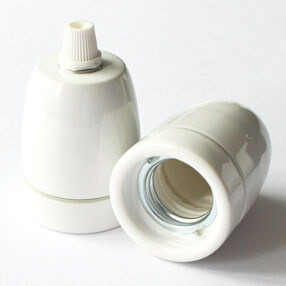 White ES Bulbholders without shade rings, with or without a white cord grip. 10mm female thread at the base. These lampholders be used with our 2 core and 3 core flex. 2 amp and 250 volts rated. Comes in 2 parts as a safety feature. Made in Italy to standard EN 60238. Lovely Glazed Ceramic E27 Lamp holders with or without a cord grip. 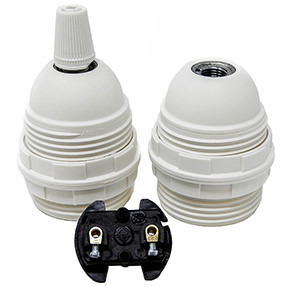 This bulbholder has no earth it has two internal screw wire terminals for Live and Neutral wires only. Dimensions: w=45mm, h=58mm or 80mm (with cord grip). 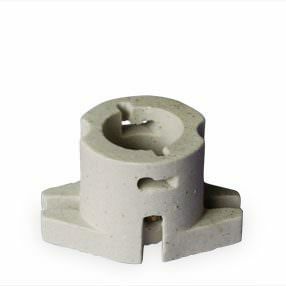 Ceramic E27 Lamp holder supplied with or without a chrome cord grip. 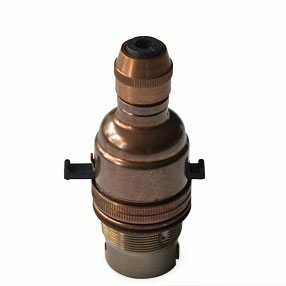 This bulbholder is M10 X1. Base entry for the cord grip is 10mm female thread. 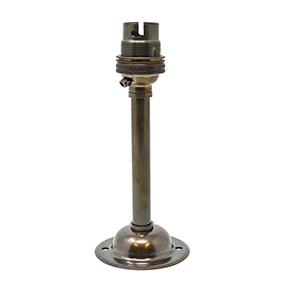 This lampholder has an earth terminal so can be used with our China or metal Ceiling Roses. 250V 4A, T220 working temperature. Made in Italy to standard EN60238. 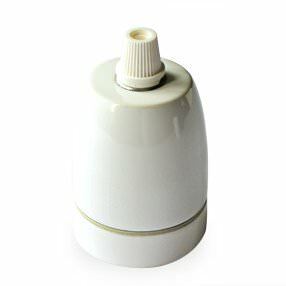 Porcelain off white glazed china batten base Lampholder for Edison Screw fitting light bulbs. Attach using the two screw holes in the base. Made in the United Kingdom to BS EN 60238. Bayonet Cap Cord Grip bulbholder. Threaded lamp holder complete with shade ring available in three finishes of antique brass, brass and chrome. Add flex for a ceiling pendant light fitting. UK made to BS EN 61184. Cord Grip lamp holder with no shade rings. 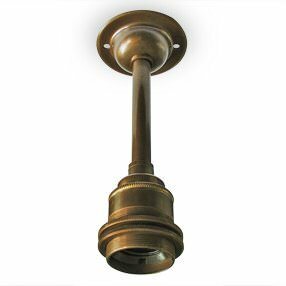 This plain bc bulbholder is available in our three finishes of aged brass, brass and chrome. For use with a ceiling pendant fitting. This takes a Bayonet Cap light bulb. Made in the UK to BS EN 61184. 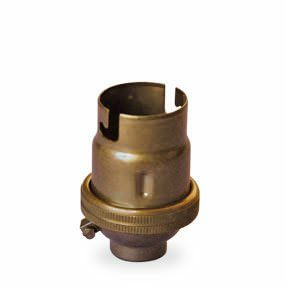 Bayonet Cap earthed Lamp Holder. 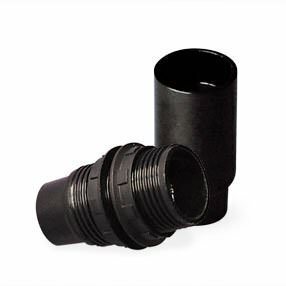 This threaded BC half inch entry bulbholder comes with matching shade rings. Available with half inch or 10mm female threaded entry in three finishes of antiqued brass, polished brass and chrome metal finish. Made in the UK to BS EN 61184. 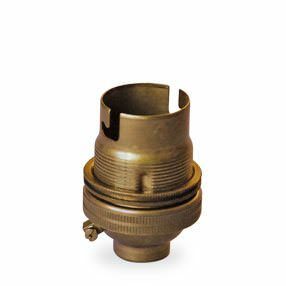 Lampholder in Bayonet Cap fitting with no shade rings. 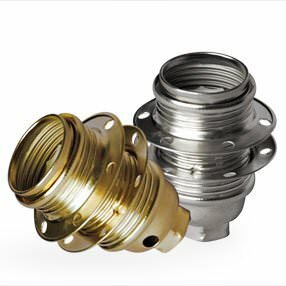 Available with with half inch or 10mm threaded base in three metal finishes of aged brass, brass and chrome. Made in the UK to BS EN 61184. Batten Lampholder with shade rings available in antique, brass and chrome finishes. Takes a Bayonet Cap bulb. Supplied with 3 screws. Used in theatres and stage make up mirrors. Made in UK to BS EN 61184. 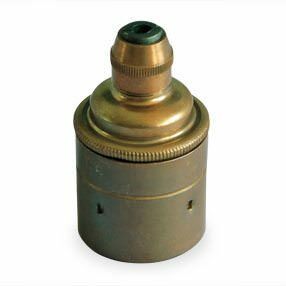 Solid Brass BC earthed Lampholder with solid brass Hook. Available in 3 metal finishes of aged, brass and chrome. 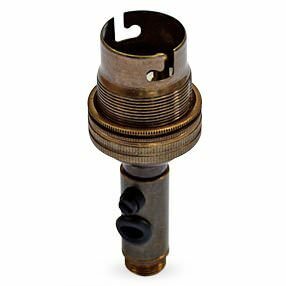 This threaded bayonet cap bulb holder comes with shade rings. Made in the UK to BS EN 61184. China lampholder. 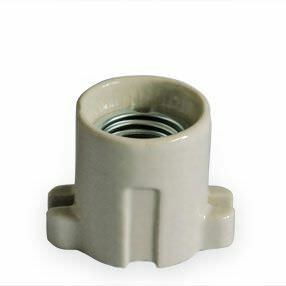 This batten base bulb holder is attached using the two screw holes in the base. 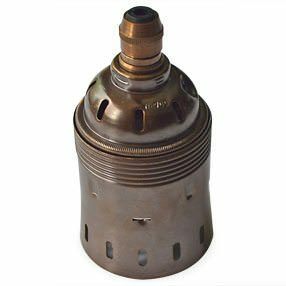 Suitable for a Bayonet Cap bulb. Made in the UK to BS EN 61184. 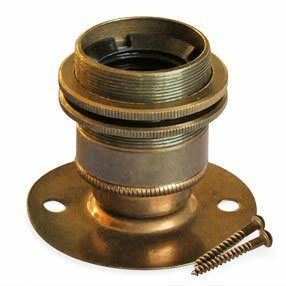 Side-Entry Lampholder with ½" male thread at the base. Comes in 3 metal finishes: aged, brass and chrome and takes a bayonet cap bulb. Includes matching shade ring and clear plastic grommet. Made in the UK to BS EN 61184. 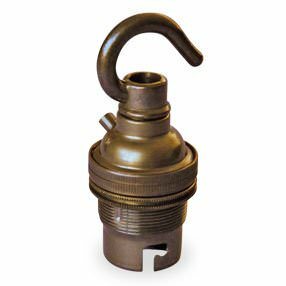 Solid brass Bayonet Cap lampholder with a 4" riser available in our three finishes of vintage brass, polished brass and chrome effect. 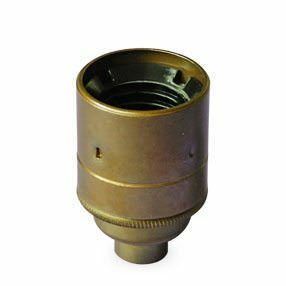 The solid brass 10cm tube comes in your matching chosen finish and matching base plate comes complete with screw holes and 2 matching screws. Dimensions w=67mm, h=170mm. Adjustable lamp holder with a 180 degree swivel rotating arm which can be angled and fixed into any position required using the wing nut on the side. 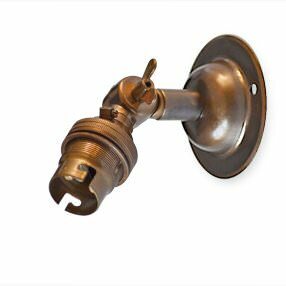 Available in antique, brass and chrome finish with a Bayonet cap lampholder fitting (not wired). 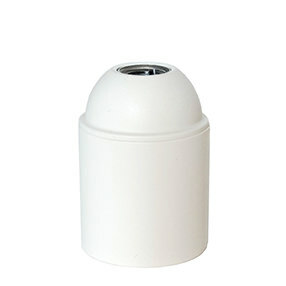 Supplied with 2 matching screws for fixing the base to a solid surface. Switched BC Bulb Holder with push bar. 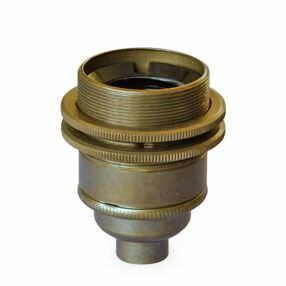 Bayonet fitting internally earthed with threaded collar and shade ring. Comes in three metal finishes of aged brass, chrome and polished brass. Half inch or 10mm entry to base. Made in the UK to BS EN 61184. 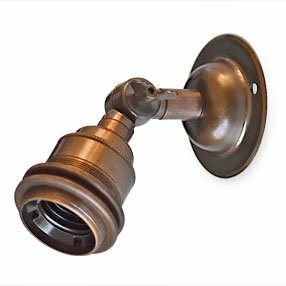 Bayonet Cap switched bulb holder with aged brass hook & matching shade rings. This takes a Bayonet Cap bulb. Made in the UK to BS EN 61184. Switched lampholder with cord grip and matching shade rings. This takes a Bayonet Cap bulb. 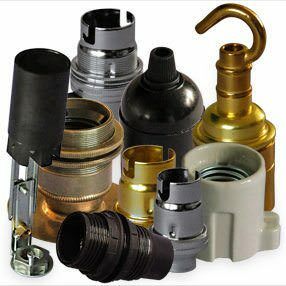 For use with a ceiling pendant fitting. Made in the UK to BS EN 61184. 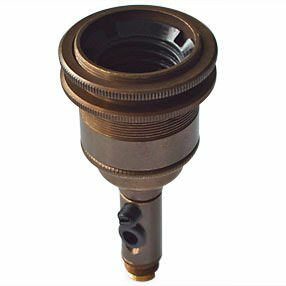 SBC (Small Bayonet Cap/B15d) earthed threaded candle Lamp Holder with shade ring. Available in aged, brass and chrome this bulbholder is available with a ½" or 10mm female entry at the base. UK Made to BS EN 61184. 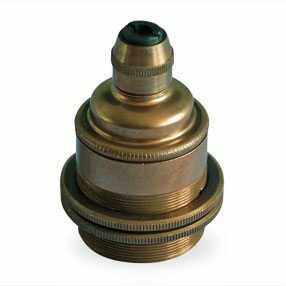 Small Bayonet Cap (SBC) earthed Lampholder with no shade rings. Available with half inch or 10mm threaded base in our vintage antique finish, brass finish and chrome.